Tired of adjusting the indicator settings losing precious time? Tired of the uncertainty regarding their efficiency? Afraid of the uncertainty in their profitability? Then the indicator ACI (automatically calibrateable indicator) is designed exactly for you. Launching it, you can easily solve these three issues just performing the simplest action: clicking a single Calibrate button. To achieve the highest efficiency, you should perform another additional action: move the power slider to the maximum. ACI will save you a lot of time that can be spent on more useful things, for example, vacation, but the effeciency will increase many times. 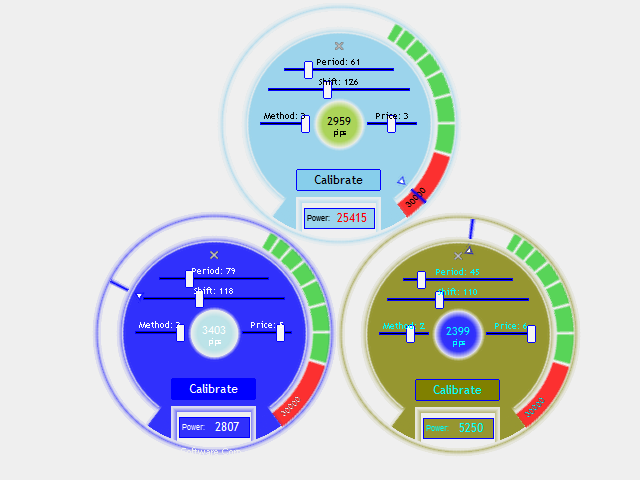 In addition, thanks to the separate graphical interface, you can not only watch but also easily change the settings of the indicator on the fly, with the ability to select calibration areas visually on the chart. Averaging period for the calculation of the moving average. Shift of the indicator relative to the price chart. The maximum price for the period. The minimum price for the period. If the closing price of the previous bar is higher than or equal to the value of the indicator on the same bar, the signal is considered as a buy one. Otherwise the signal will be considered as a sell one. Automatic calibrator and the calibrated indicator can be controlled by ACI graphical interface which reduces the amount of actions you should perform to a minimum. To start the calibration process, click Calibrate button. When the calibration power reaches the specified mark, calibration stops, or else it can be stopped by another click. Besides calibration, ACI also quickly calculates and displays the quality (profitability) of the selected parameters of the calibrated indicator at a specified time interval of a chart. The calculation is made by the method specified in the settings ("Criterion for calibration" parameter). The time interval on the chart can be changed using the levels. To do this, move the cursor to the upper or lower part of the level, highlight it with a click and start changing. If necessary, you can increase or decrease the power (Power) calibrator moving the slider clockwise or counterclockwise, respectively. The dial's transparent area allows you to adjust from 0% to 20% of the total power, the green one - from 20% to 50% and the red one - from 50% to 100%. If necessary, you can work with multiple copies of this indicator on the same chart. The indicator has multiple settings ranging from calibrated indicator parameters to ACI graphical interface ones. Default MA Period Averaging period for the calculation of the moving average, default. Default MA Shift Shift of the indicator relative to the price chart, default. Default MA Method Smoothing type, default. Default MA Price The price used, default. Default Power Default power to be achieved during calibration. Criterion for Calibration Calibration criterion. Method of calculating the quality (profitability). If you select "Total_Net_Profit", then quality = total net profit (in pips) - the total net loss (in pips). If you select "Total_Net_Profit_Total_Drawdown", then quality = total net profit (in pips) - the total net loss (in pips) - total for all signals maximum drawdown (in pips). Only bar Close prices are used. Start bar The bar for specifying the time interval beginning. Finish bar The bar for specifying the time interval end. Minimum MA Period Averaging period for the calculation of the moving average, minimum. 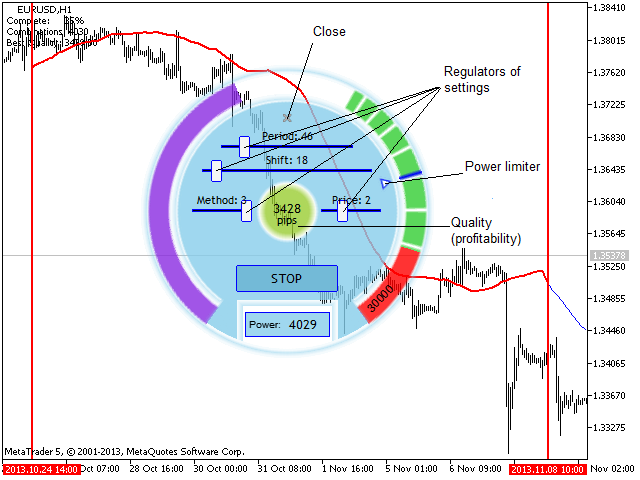 Minimum MA Shift Shift of the indicator relative to the price chart, minimum. Minimum MA Method Smoothing type, minimum. Minimum MA Price The price used, minimum. Maximum MA Period Averaging period for the calculation of the moving average, maximum. Maximum MA Shift Shift of the indicator relative to the price chart, maximum. Maximum MA Method Smoothing type, maximum. Maximum MA Price The price used, maximum. Panel size Panel size (in pixels). 0 - automatic size calculation. Panel Transparent Transparent level of panel. 0 - fully visible, 100 - fully hidden. Panel color General panel color. Font color of panel Panel fonts color. Quality color Quality (profitability) color.